Our West Compound, with direct access to our slipway, has storage space during the sailing season for about 90 small boats. These include tenders in racks and on the ground, canoes on racks and dinghies on their trolleys. There is water and power available and the compound has lockable gates. A Club tender and 4 launch trolleys are available for members’ use. During the winter the compound is used for storing cruisers. For more information contact the Compound Manager via the ‘Contacts’ Page. a) Smaller dinghies will be allocated rack spaces and larger vessels floor spaces according to what is available at the time and how much pressure there is on space. b) Sailing boats with standing rigs will normally be placed at the far end of the compound (in the shingle area) away from our neighbours to minimise the risk of complaints about noise from rigging and frapping ropes. 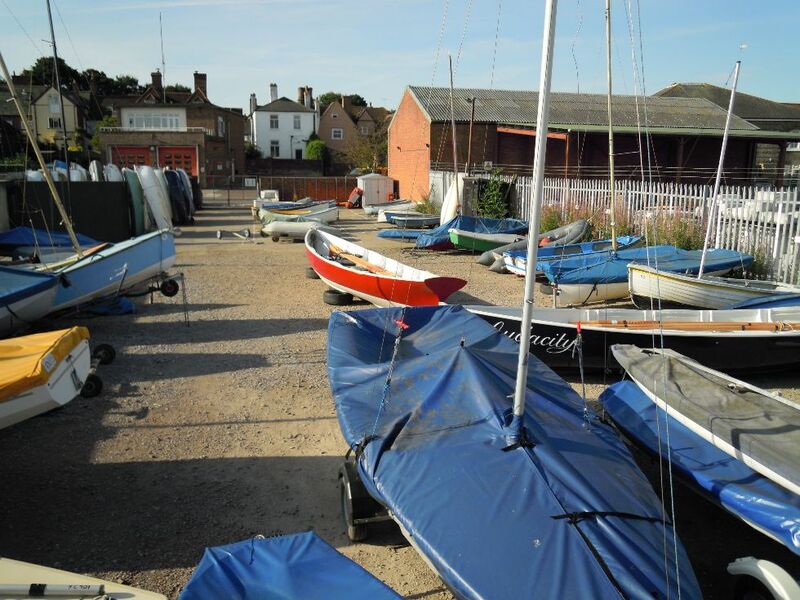 c) Larger sailing dinghies and vessels may be allocated space in the central shingle area, and must be kept on a trailer or trolley at all times to allow them to be easily moved. d) Canoes and Kayaks may only be kept on wall racks specifically setup for each vessel and not on the floor. You may be expected to adjust the rack to suit your vessel following a discussion with the compound manager. e) Wherever possible consideration will be made regarding the ease of access to boats against their size, and the physical ability of the member concerned. (Please contact the Compound Manager if you have any special requirements). However, please understand it may not be possible to satisfy the needs of everyone which may require a member to be flexible, or alternatively they may have to keep their vessel elsewhere. f) New allocations must be made via email or a written note, and are offered on a ‘first come first served’ basis depending on suitable space being available. Please note that at the beginning of the season priority will be given to existing users renewing and paying for their compound allocation before the publicised renewal cut off date. After the that cut-off date new applications are considered and processed in the order in which they are received and against appropriate space being available. NB. Unpaid allocations from the previous season may be lost at this point. g) Trailers and trolleys (unless under a vessel allocated summer space) together with any other items such as wood blocks, props, ladders etc, that belong to cruisers stored in the compound during the winter period may not be stored during the summer period and may be discarded without further discussion. h) All items allocated space for summer compound storage must be CLEARLY marked with your membership number otherwise they will be removed without warning (as the owner clearly cannot be identified and therefore contacted). This is also of great importance to help identify members property that is found elsewhere when interfered with or stolen. j) Whenever possible, a ‘clear’ period will be announced towards the beginning and end of each season to allow members to prepare boats, and pass through the compound unfettered to launch them. k) Your vessel/s* must fit within their allocated space at all times, including when on their trailer or trolley and when rigs are lowered. The vessel must normally be present for the majority of the time otherwise ‘g’ above may well apply. If this is being abused at any point then the immediate removal of the offending object/s will be requested. l) Please only keep your vessel in its allocated space, and put other vessels back immediately if you move them to gain access to your own. m) Any special requests received will be considered, and if needs be discussed within the committee before a response is made. n) Members that do not take full advantage of this facility may be asked to relinquish their compound allocation if there is a shortage of available space for members with a more active need. o) Finally, there are times when the best laid plans go awry, eg. during regatta events, at cruiser lift in/lift out, or when other clubs visit – please try to accommodate these moments and help us keep things running as smoothly as possible! p) Flood gate and security; You MUST close the Flood Gate if you are not 100% sure that someone will be using the entrance in the immediate future (effectively that means before you leave) in which case you must also lock the compound. It is a necessary inconvenience that other river users may see the gate shut when they are only a few minutes away – thats life! We appreciate every effort to help us keep the compound in use for all and clear of unnecessary debri, however, please be aware that members who are not able to follow our guidelines risk losing the privilege of Compound use in the future.